Edwinstowe House – Military Wedding 5th December 1913 at Edwinstowe. The bride, who is the daughter of the late, Mr. Edward Wright surgeon, and Mrs. Wright. Miss Muriel wore a gown of ivory charmeuse, marquisette, prettily draped, with court train of brocade crepe de chine, on which two large tulle wreaths with orange blossom. The train was carried by a little page, Master Kenneth Bond, who was dressed in white. Her veil was Brussels net and was arranged over a wreath of orange blossom. Captain Hume is the son of Colonel Hume, late commanding 1st Battalion Sherwood Foresters, and Mrs. Hume, Camberley. Miss. Isabel Wright (sister of the bride), Miss. Connie Lathloury and Miss. Margaret Wilson were bridesmaids, and they wore white chiffon accordion pleated dresses, scarlet charmeuse coatees, chairmen’s cossets edged with fur, with black velvet hat, with shaded feather to match, and they carried white bouquets, the gift of the bridegroom. There were also three groomsmen – Captain Clarke, Mr. J. K. Lane Mr. Clarke all of the 8th Battalion Sherwood Foresters. The officiating clergy were the Rev. K.V. Bond (vicar of Edwinstowe), the Rev. Mr. Hales, chaplain to the battalion, and the Rev. W. Paley Reade, and the service was fully choral. Willing Bandit had decorated the chancel with flowers. Garnet brooches were the bridegroom’s gift to the maids. Captain B. 2nd Battalion Sherwood Foresters, acted in the capacity of best man, Capt. B.G.V. Way, M.V.O. In addition to the hymn mentioned, ‘O Perfect Love’ was sung, and the address was delivered by the battalion chaplain. The register having being signed in the vestry, the bridal party left the church to Wedding March, and they passed under the arch of crossed swords formed by officers and permanent staff of the 8th Battalion. The sun shone, and a merry carillon proceeded from the belfry. A reception (RSA provided the catering) was held by the bride’s mother at Edwinstowe House, where the regimental band, under Sergeant Markham, played a selection of music. A large marquee was fixed in the grounds in the grounds adjacent to the house, and the guests assembled there and partook of the wedding breakfast. Later the bride and bridegroom left for Nottingham by motor car en route for London, where the honeymoon will be spent, prior to sailing for India next week. Mrs. Hume’s going away gown was a navy-blue brocade crepe de chine with a broad belt of tango red, and hat to match. Major & Mrs. Huskinson – Tortoise-shell and silver box. Colonel & Mrs. Lister – Dali rest? Captain Hugh B. T. Hume of the 8th Battalion Sherwood Foresters was invalided home from France suffering from an internal complaint. He had been conscripted to India just after his wedding to Miss. Muriel Wright of Edwinstowe House. He returned to Edwinstowe House to recover. He died 19th June, 1935 aged 54 at Alton, Hants. He was buried 22nd June, 1935 at St. John the Evangelist Church, Churt, Surrey. Muriel Mary Wright was Born in April, 1885 at Southwell. Her father was Edward Wright, a surgeon who was born in the Parish of St. Mary’s, Nottingham. He died in 1911. Her mother was Catherine Bellman Wright. Muriel attended school in Broadstairs, Kent. In 1916, she not only ran the Sunday School, she held a Sunday School Treat at Edwinstowe House for about 150 children with 120 from Edwinstowe and the rest from Carburton and Clipstone. She was a member of the Rufford Hunt and was on the committee for agricultural war work. Meetings were held in the Royal Oak. Muriel appears on the Electoral Registers 1931 – 39 living at Churt, Surrey. There are no records until her name appears in the Electoral Registers for Edmonton, London from 1946-1953 inclusive at 25, Queen Anne’s Place, Enfield. 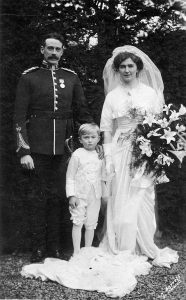 Possibly, being a widow, she moved to Northern Rhodesia on the marriage of her daughter Diana and Guy. She died on 7th July, 1966 at Nazareth House, Salisbury, Rhodesia. Her Will was proved at the London Probate Office and she left an estate worth £22,662. Hugh left £3,574 12s 4d at his death in 1935. There is no register of the birth of their daughter Diana Mary in Edwinstowe, but as her parents sailed for India shortly after their marriage, it is possible that she was born there. In 1921, Diana and her parents were resident at 617, Finchley Road, Hampstead, London in what appears to be a property of multiple- occupation, possibly flats. Hugh Hume, retired, age 47, Muriel Hume aged 43 and Diana Mary Hume aged 13. They had sailed 2nd class from Durban, South Africa on the Carnarvon Castle, owned by The Union-Castle Mail Steamship Company Ltd. Their address is recorded as: c/o Captain W.N. Wright, Ardock Lodge, Lewdown, South Devon. This was Muriel’s brother William Noel Wright. In 1937 Diana, at age 22, was listed at 42/44, Emperor’s Gate, Kensington, SW7, together with 22 other females. This may have been a college for young ladies. 18th October, 1952 The Outgoing Passenger List records Diana’s departure from London on the P. & O. ship ‘Mulbera’ to the port of Beira, Mozambique. Her U.K. address was The Cottage, Winkley, Devon. On January 9th, 1954, at Lusaka, Northern Rhodesia she married Guy Newland Hornby of Chisamba, Northern Rhodesia.